This evening after getting back from dinner with some friends, I had to go pick up potato sacks (sack races) for a family reunion we’re having this weekend. Rather than hopping back into the car, I decided to get on the RedLine 925 and ride down the street to my buddy’s house. I made sure I had some lights, my helmet and a my bike messenger bag. Typically when I have to run to the store or down to a friends house, I’ll just jump on my bike instead of the car. I figure by the time I get in the car, drive to the store, and find parking, I would have already gotten there with my bike. Anyway, my point is, take the bike on some of the simple errands. 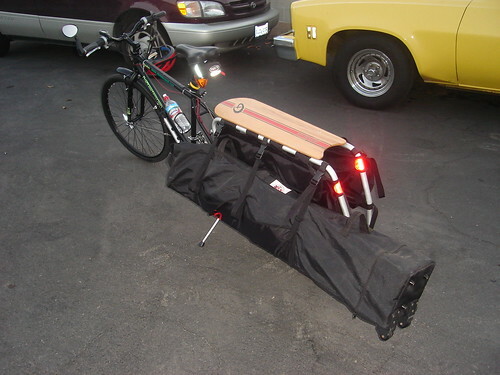 But if you do have to go buy water or detergent or any thing bulky, consider getting an Xtracycle. The FreeRadical is an awesome addition to the utilitarian in all of us. When I was testing it, I carried a 24 pack of water bottles, 6 gallons of water, 6-2 liter bottles of soda and an Ez-UP Canopy.